The education leaders who will guide Charlotte Teachers Institute’s 2013 seminar season represent the inclusive and creative focus that distinguishes this unique professional development initiative. 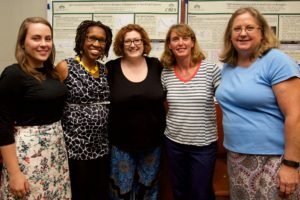 CTI is a partnership of UNC Charlotte, Davidson College and CMS working to cultivate content knowledge, creativity, leadership skills and collaboration within and among CMS teachers. Two local educators will join committees at the Yale National Initiative, of which CTI is an affiliate. Yale named Torrieann Dooley, David Cox Road Elementary School second-grade teacher, to its National Steering Committee and named Ann Fox, English professor at Davidson College to its National University Advisory Council for a fourth time. New members of the steering committee are: Tiffany DiMatteo, English, Myers Park High School; Nicole Fraser, fifth grade, Davidson Elementary; and Jashonai Payne, fifth grade, David Cox Road Elementary. Returning Local Steering Committee members are: Intisar Hamidullah, language arts, Whitewater Middle School; Matthew Kelly, Spanish, Independence High; Beth Lasure, art, Mallard Creek High; Michael Pillsbury, math, Randolph IB Middle; Deb Semmler, physics, East Mecklenburg High; Barbara Wesselman, apparel/costume design, Northwest School of the Arts; Cindy Woolery, science, Elizabeth Traditional Elementary; Torrieann Dooley, second grade, David Cox Road Elementary. “Urban Encounters: Hispanic and African American Literature” – Davidson College Brenda Flanagan, professor of English; Stefanie Carter-Dodson, Martin Luther King, Jr. Middle language arts teacher. CTI also introduced a full cadre of school contacts. These school contacts are essential to the success of the initiative, as they act as advocates and liaisons within each of the schools, Gartlan said. CTI will host an open house on Thursday, Feb. 28 at 5:30 p.m. at UNC Charlotte Center City at 320 E. 9th Street to introduce its 2013 educator leaders and its seminars. Details and registration information are available on the CTI website at www.charlotteteachers.org. Teacher applications to participate in the seminars are online and are due March 13. Posted on February 25, 2013 by Scott Gartlan. This entry was posted in CTI News, News. Bookmark the permalink.